(MoneyWatch) In a move that could have a dramatic impact on the cost of auto financing through dealerships, the Consumer Financial Protection Bureau has issued new rules that would make lenders responsible for discriminatory pricing on auto loans -- even when they didn't strike the deal. Previous studies of auto loans have found that mark-ups on loans -- largely invisible to the buyer -- can cost borrowers hundreds, even thousands, of dollars. Those hardest hit are minority borrowers, who often pay twice or three times as much as someone who is white. "This is going to put severe pressure on car dealers not to do these bad deals," said Kathleen Day, a spokeswoman with the Center for Responsible Lending. "If they do, the banks that are providing them money are going to start having to pull their credit." The ruling also allows the fledgling consumer protection agency to make an end-run around congressional restrictions that bar the agency from policing auto dealerships, which provide financing for about 70 percent of auto purchases. That's because most dealer-financed loans are ultimately purchased by lenders that are regulated by the CFPB. This ruling would hold these lenders responsible if they buy a loan that was made in a discriminatory way. But to understand the issue, it's important to take a step back and walk through the process of buying a car. Consumers know to do their homework on auto pricing before they show up at a dealership, so they often know how much the dealer paid for the car and can estimate a reasonable mark-up. But much of the profit on an auto sale is made on the financing, and few consumers think to check auto financing rates before they leave home. As a result, the car dealer can let the consumer "win" on the auto price negotiation, knowing that there can be significant profits to be made on the financing. In fact, once you've decided to buy, the dealer will ask if you want them to arrange an auto loan. If so, they'll run your credit and likely say that they're going to shop a number of lenders that have agreed to provide financing to the dealership to get you the best price. Unbeknownst to most consumers, lenders habitually allow the dealer to mark up their loans. So if the lender would have provided credit at, say, 6 percent, the dealer may have the discretion to charge the consumer as much as 10 percent. The lender and the dealer then share the additional profit on the financing. This mark-up is largely invisible to consumers because, while dealers must say how much interest you are being charged, they don't have to tell you whether you could have received a better deal had you shopped around. A 2011 study by the Center for Responsible Lending, a non-profit advocacy group, estimates that these invisible loan mark-ups cost auto buyers about $26 billion. The cost per transaction varies dramatically by dealership, state and ethnicity. Another study by the National Consumer Law Center, which filed a series of class-action suits against auto lenders in the 1990s, showed actual mark-ups ranging from a few hundred dollars to more than $1,200. The borrowers who paid the most were borrowers of color, said John Van Alst, an NCLC attorney. For instance, a white borrower in Texas paid a mark-up of $860. A black borrower with the same credit at the same dealership paid $1,272. Van Alst can't say whether the high prices were the result of discrimination or just that the dealer sized up the borrower and thought they'd be willing to pay more. Still, the results were the same -- while most borrowers paid a mark-up, the mark-up paid by people of color was sometimes three times more. The CFPB's new rule would not eliminate such mark-ups, but it aims to make them more standard so that African-American and Hispanic borrowers don't pay higher rates. 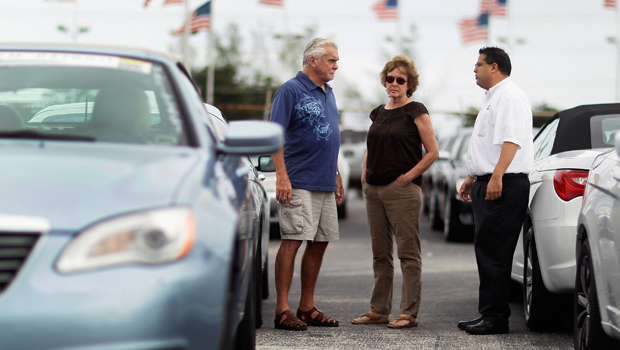 In announcing its new rule, the agency also advised borrowers to protect themselves by shopping for financing before they walk into an auto dealer. In many cases, consumers can get a far better financing rate with their own bank or credit union than they can get at a dealership.